The Monument To The Great Fire Of London is located near Monument Tube station and is on the same end of the Thames near The Tower of London. This was built by Sir Christopher Wren and Dr Robert Hooke to remember the Great Fire of London in 1666. It is the tallest Doric free standing column in the world. I had read about this in one of my travel books and always thought it would be cool to go up so we tied it in to one of our trips to London. We were lucky because it was a winter's day but the weather as you can see from the picture was perfect. The views from the Monument are breathtaking. 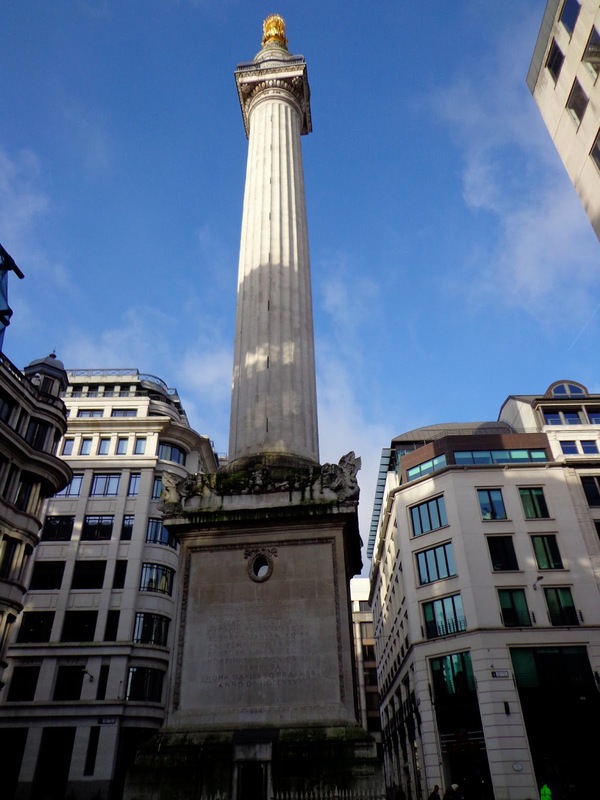 This is very easy to get to but I would suggest that if you are wanting to go up the Monument, that you make this one of the first things to visit because the viewing platform is very small and the 311 stairwell are narrow. You can take children but it is not accessible by wheelchair users. You can get a 2 for 1 ticket if you have taken the train to London or you can get a combined ticket to the Tower Bridge Exhibition, which is within walking distance. If you planning a full day out, visit The Monument, Tower Bridge and Tower of London, in that order. There are plenty of coffee shops, pubs and restaurants in the area.